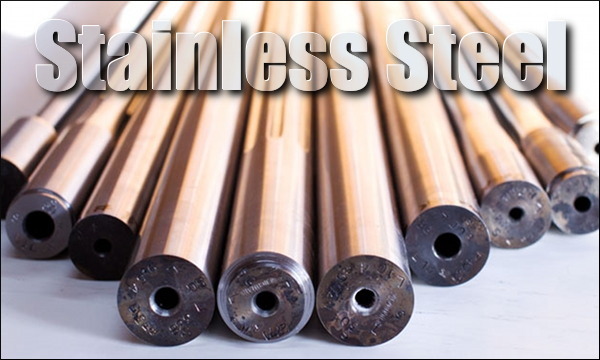 Most modern match rifle barrels are stainless steel alloy. These are from Benchmark Barrels. Though some grades of stainless are more corrosion-resistent, ALL varieties of stainless steel can rust if they are not handled and stored properly. Some folks feel that they don’t have to worry about rust and corrosion on stainless steel barrels, actions, and other components. That’s not really true. “Stainless” is a bit of a misnomer. First, there are different types of stainless steel alloys, with different degrees of rust resistance. 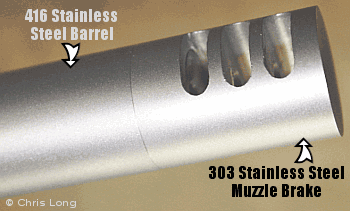 300 series stainless is more corrosion resistant than the 416 stainless commonly used in barrels. The composition (by percentage weight) of 416 stainless is 0.15% carbon, 12-14% chromium and the rest iron. 416 stainless steel lacks the roughly 10% nickel content that makes the 300 series more corrosion resistant in atmospheric conditions. But because 416 handles pressure better and is easier to machine (than 300 series steel), 416 stainless remains the better choice for barrels. Forum member Jacob, who is studying materials science at LSU, provides this technical information: “The basic resistance of stainless steel occurs because of its ability to form a protective coating on the metal surface. This coating is a ‘passive’ film which resists further ‘oxidation’ or rusting. The formation of this film is instantaneous in an oxidizing atmosphere such as air, water, or other fluids that contain oxygen. Once the layer has formed, we say that the metal has become ‘passivated’ and the oxidation or ‘rusting’ rate will slow down to less than 0.002″ per year (0.05 mm per year). Unlike aluminum or silver, this passive film is invisible in stainless steel. It’s created when oxygen combines with the chrome in the stainless to form chrome oxide which is more commonly called ‘ceramic’. This protective oxide or ceramic coating is common to most corrosion resistant materials. Halogen salts, especially chlorides, easily penetrate this passive film and will allow corrosive attack to occur. The halogens are easy to recognize because they end in the letters ‘ine’. Listed in order of their activity they are: fluorine, chlorine, bromine, iodine, astatine. CONCLUSION: Stainless steel barrels and components won’t rust nearly as fast as blued steel, but you still have to take precautions — particularly removing sweat and corrosive salts from the barrel. Also, don’t let moisture build up inside or outside of the barrel. We recommend wiping your barrels and actions with Eezox, or Corrosion-X after each use. These are both extremely effective rust-fighters that go on thin, without leaving a greasy residue. (Eezox leaves a clear finish, while Corrosion-X has a slightly waxy finish.) Also store your guns in Bore-Store bags when the guns go in the safe. Bore-Stores wick away moisture, and the synthetic fleece inner surface is treated with rust-fighting chemicals. Bore-Stores also protect your guns against dings and scratches. Share the post "Stainless Steel & Corrosion Resistance — What You Need to Know"
Wintertime is here, the season of cold and damp… and RUST. There’s snow on the ground in many parts of the country. If you want your fine firearms to remain pristine and rust-free through the winter months, it’s wise to protect then while they are stored in a safe. You should protect blued surfaces with a rust-blocker. In addition, we recommend storing guns in protective sleeves. Our take on Bore-Store Gun sleeves is simple: They work great, so buy them and use them — for ALL your valuable firearms. These thick, synthetic-fleece sacks cushion your guns, preventing nicks and scratches. The breathable fabric wicks away moisture, and the fibers are coating with corrosion inhibitors. I personally use Bore-Stores for in-safe storage with all my guns, and I have never had one of my guns rust inside a Bore-Store, even when I lived a stone’s throw from the ocean. Photo from Pistoleer.com, a Bore-Store vendor. Bore-Stores are offered in a wide range of sizes, so you can find something to fit everything from a Snub-nosed revolver to a 32″-barrelled 50 BMG. Rifle-size Bore Stores can be purchased for $13.00 – $21.00 from Brownells. For long F-Class or tactical rifles, we recommend the 10″x52″ Scoped Shotgun Bag, Brownells item 132-000-003WB. You can also order direct from the Bore-Store manufacturer, Big Spring Enterprises, www.BoreStores.com. Big Spring will also craft custom sizes on request. While we prefer Bore-Stores for regularly-used guns, if you have heirloom firearms that will be kept in storage for very long periods without seeing any use, you may want to grease them up and place them in the thin, but rugged three-layer storage bags sold by Brownells. 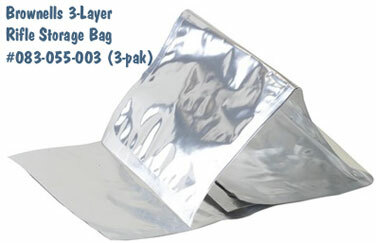 The bags are made from a three-layer laminate of polyester, aluminum, and polyethylene film, with a shiny silver exterior. Though the laminate is thin, the Brownells storage bags are puncture-resistant, and have a 0% moisture transmission rating so moisture can’t get inside. These bags are also resistant to petroleum-based chemicals and they won’t break down even in contact with soil or moisture. Here’s one VITAL bit of advice for using these bags. Be absolutely sure, before you seal up the bags, that your guns are DRY and that all metal surfaces have been coated with an effective anti-corrosive, such as BoeShield T9 or Eezox. Brownells’ storage bags are inexpensive. A three-pak of 12″x 60″ rifle sacks (item 083-055-003WB) costs just $22.99 — under eight bucks a gun. That’s cheap insurance for rifles and shotguns that may cost thousands of dollars. Just about the worst thing you can do in the winter (short of leaving your rifle outside in the rain) is to store firearms in tight, foam-padded cases. The foam in these cases actually collects and retains moisture from the air, acting as the perfect breeding ground for rust. Remember, those plastic-shelled cases with foam interiors are for transport, not for long-term storage. Don’t repeat the mistake of a wealthy gun collector I know. He stored four valuable Colt Single Action Army (SAA) revolvers in individual foam-padded cases, and locked these away in his gun safe. A year later, every one of his precious SAAs had rusted, some badly. Share the post "Smart Tip for Winter Storage in Gun Safes — Bag Your Guns"
Scary stuff — AK-74 after firing corrosive ammo and not being cleaned for a week. No doubt you’ve heard the term “corrosive” used with respect to ammunition. But what exactly is “corrosive ammunition” (and how does it different from non-corrosive ammo)? What is the chemistry that leads to corrosion, and what cleaning procedures should you follow if you shoot corrosive ammunition? Brownells has come up with answers to these and other questions in a helpful TECH TIP video about corrosive ammo. In this informative video, Brownells gun tech Steve Ostrem explains the primer-related chemistry that makes some ammo corrosive. The video then reviews suggested cleaning procedures you should follow after you have fired corrosive ammo through any firearms. What makes ammo “corrosive”? Generally speaking, primers are the problem. When corrosive ammunition is fired, the ignited primers leave a residue of corrosive salts. Typically these primers contain potassium chlorate, or sodium petrochlorate which, when burned, change into potassium chloride or sodium chloride. Sodium chloride is also known as common table salt. Potassium chloride and sodium chloride are both very hygroscopic (i.e. they attract water). Because of that, these alkalis are rust generators. When exposed to the hydrogen and oxygen in the air (and moisture) potassium chloride and sodium chloride can form an acid that quickly causes metal rifle parts to rust and pit. Given a choice, you may wish to avoid corrosive ammo altogether. However, for some types of fire-arms, particularly older military-style rifles, the most affordable ammunition may be corrosive. 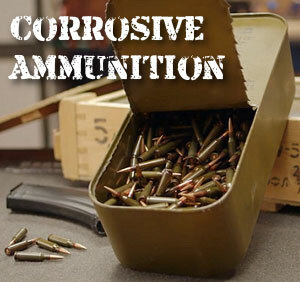 If you choose to use corrosive ammo, it is important to clean the gun thoroughly after use. After firing, you want to use an element that will neutralize the primer salts. Brownells suggests a water soak (see video above). Alternatively, Windex with ammonia can help neutralize the salts, but that doesn’t finish the job. 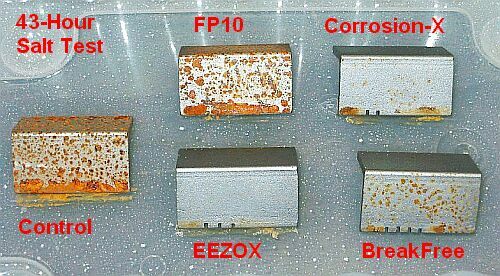 After the salts have been neutralized and flushed away, basic anti-corrosion protectant (such as Eezox or other gun oil) should be applied to all metal parts. To learn more about the proper procedures for cleaning rifles exposed to corrosive ammo, we suggest an article by Paul Markel on Ammoland.com. Markel, host of the popular Student of the Gun TV series, states that: “Windex (with ammonia) is the Corrosive Ammo shooter’s best friend. After you are done shooting your corrosive ammunition for the day, squirt the window cleaner liberally from the chamber down the barrel. Pull the bolt / bolt carrier / op rod if there is one and douse them as well. A couple of old cotton t-shirts will come in handy. A cotton barrel swab is a nice accessory but you can make do with patches. Some folks will rinse all of the ammonia and loosened corrosive salts off with hot water. Others prefer to wipe it all down and let the ammonia evaporate. Either way, once the corrosive salts have been tackled with the window cleaner, it is time for an all-purpose brush (old toothbrush) and some gun oil.” READ Full Article by Paul Markel. Video Tip from EdLongrange. We welcome reader submissions. Share the post "Tech Tip: Coping with Corrosive Ammo"
Wintertime, the season of cold and damp, is right around the corner. There’s already snow on the ground in some parts of the country. If you want your fine firearms to remain pristine and rust-free through the winter months, it’s wise to protect then while they are stored in a safe. You should protect blued surfaces with a rust-blocker. In addition, we recommend storing guns in protective sleeves. Our take on Bore-Store Gun sleeves is simple: They work great, so buy them and use them — for ALL your valuable firearms. Bore-Stores are offered in a wide range of sizes, so you can find something to fit everything from a Snub-nosed revolver to a 32″-barrelled 50 BMG. Rifle-size Bore Stores can be purchased for $12.00 – $21.00 from Brownells. For long F-Class or tactical rifles, we recommend the 10″x52″ Scoped Shotgun Bag, Brownells item 132-000-003. You can also order direct from the Bore-Store manufacturer, Big Spring Enterprises, www.BoreStores.com. Big Spring will also craft custom sizes on request. Share the post "Consider Bore-Stores for Winter Storage of Fine Firearms"
Is “Stainless Steel” Really Rust-Proof? Share the post "Is “Stainless Steel” Really Rust-Proof?" We’re well into December, and that means many readers will be putting guns in storage for a few months. It also means the weather is cold and damp — conditions that encourage corrosion. To ensure your rifles remain rust-free over the winter, we recommend some preventative measures. First clean the bore thoroughly, and remove carbon and gunk from the action areas. Slide a couple oiled patches down the bore and make sure that any bare metal parts (including sights, trigger guard, action, and bolt) are coated with some protective oil. We recommend Eezox, Boeshield T9, or CorrosionX. Eezox leaves a glossy dry film shield with excellent rust resistance. CorrosionX is more like a conventional oil, but with special anti-rust additives. Boeshield T9 leaves a slightly thicker, wax-like coating that blocks all kinds of oxidation, even on aluminum parts. Before you put your guns away for the winter, you may want to pack them in long-term storage bags. You can get superior protection with ZCORR long-term storage bags. 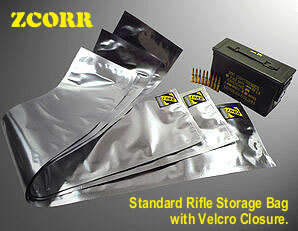 Used by the USMC for arsenal storage, ZCORR bags are like the ultimate zip-lock baggie. They keep air and moisture out, and the interior is impregnated with corrosion inhibitors that block rust. The basic long-gun bags cost $12-$16, and have a velcro closure. 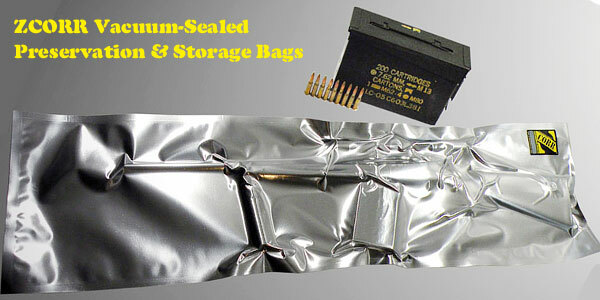 The “Collectors Series” storage bags ($22-$30 for long-guns) feature a foil-adhesive closure that is 100% air and water tight. The deluxe preservation-grade ZCORRs, priced at $32-$39, can be vacuum-sealed for maximum protection — just hook up a vacuum cleaner to the special one-way valve. See photo below of rifle in ZCORR Vacuum storage bag. The laminated material used in ZCORR bags is puncture-resistant, tear-resistant, and will not harm any non-metal surfaces. Two key elements in bag’s laminate construction allow ZCORRs to block corrosion: 1) the foil barrier layer; and; 2) the VpCI-impreg-nated sealant layer. 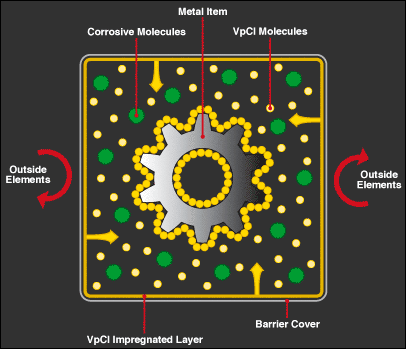 The VpCI-impregnated inner layer provides the anti-corrosive properties. The VpCI chemistry impregnated in the interior layer migrates out of the plastic and forms an invisible gas inside of the bag. This gas is made up of VpCI molecules that are attracted to the interior and exterior metal surfaces of your firearm. The gas coats these metal surfaces with a one-molecule-thick layer of VpCI chemistry that stops corrosion before it can begin. This one-molecule-thick layer of VpCI chemistry dissipates off of the firearm when it is removed from the bag. Share the post "Protect Guns with Rust-Fighters and Vapor-Barrier Storage Bags"
Here’s a smart new product that monitors the temperature and humidity inside your gun safe — with a convenient LCD display unit located on the outside of the safe. You don’t need to string wires or cut a small hole in your safe — there are two separate components, one inside and one outside. The sensor unit (on the inside) communicates wirelessly with the display unit (on the outside). 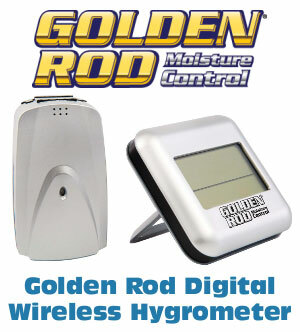 The new GoldenRod Wireless Hygrometer was designed to display the temp/humidity in your safe without the need to open the safe. 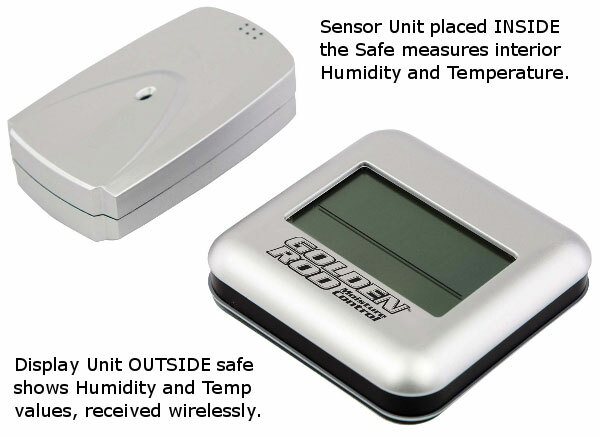 NOTE: the wireless LCD display can show BOTH in-vault AND in-room humidity and temperature levels. You can attach the display to the vault door with its built-in magnet, or simply place the display unit on top of the safe using the handy flip-out kickstand. The unit costs just $20.89 at Amazon.com. Measures In-Vault and In-Room humidity from 20% to 95%. Measures In-Vault temperature range from 14°F to 122°F. Measures In-Room temperature range from -4°F to 158°F. Records Min/Max temperature and humidity history. Share the post "Wireless Sensor Measures Temp and Humidity Inside Gun Safe"
Share the post "Anti-Corrosion Products Test — Video Reveals Best Rust Blockers"
When evaluating firearm finishes, one should consider hardness, chemical resistance, lubricity, abrasion resistance, and color. However, none of these factors are as critical as corrosion protection. 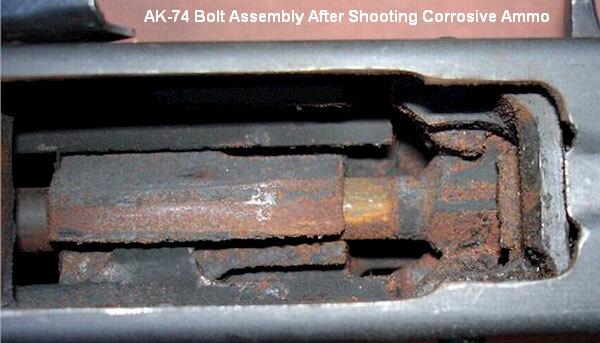 The average firearm owner deals with corrosion more than any other finish-related problem. Accordingly, when selecting an exterior finish for the metal components of your guns, you should look for a product with superior corrosion resistance. Thanks to Cerakote, we now have some science to help you make that decision…. How well do various firearm finishes resist corrosion? Eight (8) various finishes are tested, including Blueing, Cerakote, DuraCoat, FailZero, Ion Bond, KG Gun Kote, NiBX, and Phosphate (Parkerizing). Eight metal firearm components (each with a different finish) are placed into the salt chamber to see how long it takes for each finish to show initial signs of corrosion. To provide a baseline for comparison, a “naked” 416 stainless steel barrel was also placed inside the test chamber. The test was started, and for each coating, the time was recorded when corrosion started to appear. FYI, if you thought “stainless steel” can’t rust, think again. The stainless barrel sample (along with the blued metal sample) showed visible corrosion after just 24 hours! According to ASTM B117-03, the Corrosion Test provides a controlled corrosive environment which has been utilized to produce relative corrosion resistance information for specimens of metals and coated metals exposed in a given test chamber. The salt chamber is set to a temperature of 95 degrees Fahrenheit with a 5% salt concentration. 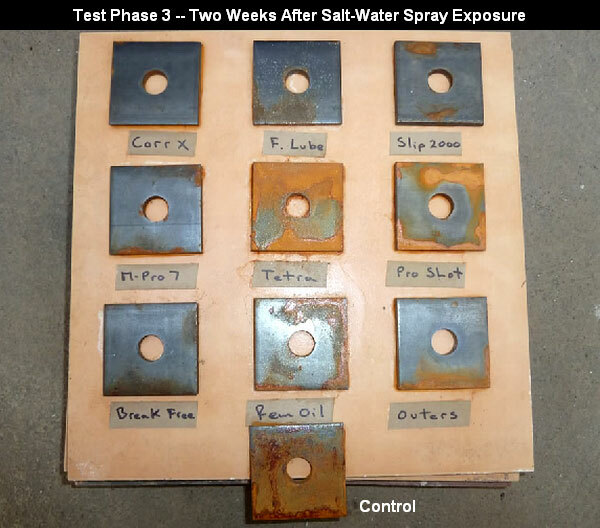 Salt Chamber testing is used to draw a comparison between metals and finishes and does not correlate to a specific number of hours of real world use. 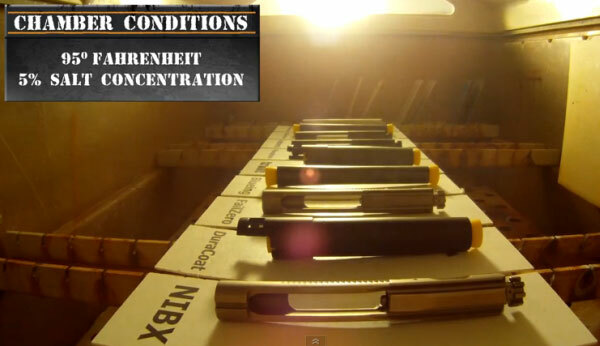 Share the post "Firearm Finish Comparison Testing in Salt Chamber"
Winter is coming and that means cold temps and wet weather. Heck it’s even raining in California this week. When it’s cold and damp out, you need to pro-actively guard against rust and corrosion on your valuable tools and firearms. As temperatures drop, moisture can condense from the air, causing guns to rust, even if they are stored in a safe. We recommend that you use a proven corrosion inhibitor to protect your firearms during winter storage. We did extensive testing and recommend three products to combat rust: BoeShield T-9, Corrosion-X, and Eezox. These are all excellent products, but this Editor’s first choice is Eezox, because it cleans as well as protects, and because Eezox does not leave a sticky or waxy coating on your arms. 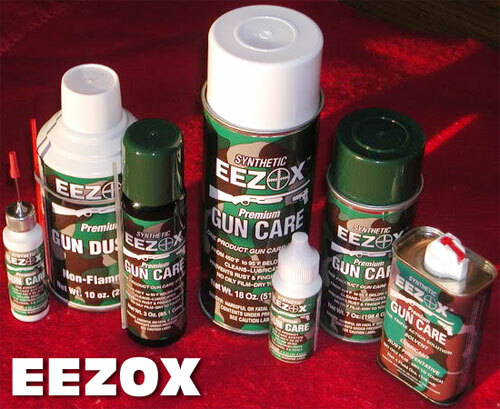 Eezox is also ideal for fine, blued firearms. After 2-3 light applications it provides a dry protective finish that allows high polish blueing to shine through. Eezox is available in small drip bottles, 4-oz. cans, and 4-, 6-, and 18-oz. aerosol spray cans. 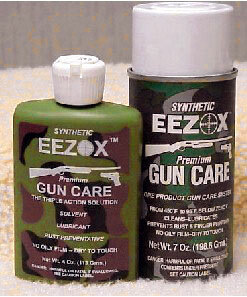 We typically apply Eezox to a patch from an aerosol can, then wipe down the firearm. Let the Eezox dry, then reapply. This will give you outstanding protection. Just make sure you wipe down ALL the metal surfaces, which may require removing the barreled action from the stock. We’ve seen examples of guns that rusted on the underside of the action because the owner had only bothered to wipe down the barrel and exposed section of the action. You can purchase Eezox from gun stores ($8.99 for 7 oz. can average price), or Warren Custom Outdoor. Those plastic-shelled cases with foam interiors are for transport, not for long-term storage. Don’t repeat the mistake of a wealthy gun collector I know. He stored four valuable Colt Single Action Army (SAA) revolvers in individual foam-padded plastic cases, and locked these away in his gun safe. A year later, every one of his precious SAAs had rusted, some badly. For storing long guns in your safe, we strongly recommend Bore Stores. These synthetic fleece gun sacks are coated with silicone and corrosion inhibitors. The thick fleece also protects your guns from nicks and scratches. Rifle-size Bore Stores can be purchased for $13.00 – $18.00 from Brownell’s, or MidwayUSA, or direct from the manufacturer Big Spring Enterprises, which can also craft custom sizes on request. 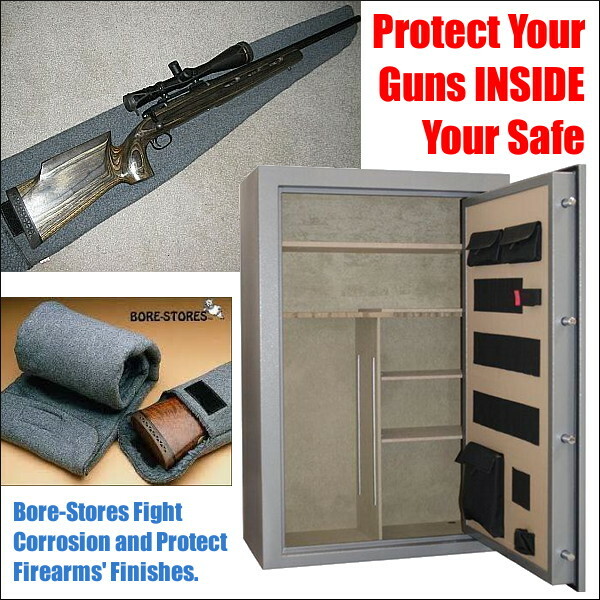 Share the post "Combat Corrosion with Rust-Fighting Products"
For storing fine firearms in a gunsafe or storage locker, we recommend Bore-Stores. These thick, synthetic fleece bags are treated with silicone and a special rust inhibitor to safeguard against rust and corrosion. Bore-Stores also cushion your rifles, protecting against nicks and dings while you’re moving your guns in and out of the safe. Right now, through the end of September, MidwayUSA has most popular sizes of Bore-Store bags on sale. Bags for 4″ and 6″-barreled pistols are marked down from $5.89 to $4.99, and the 46″ Scoped rifle Bore-Store bag (item 570349) is just $9.99, reduced from $11.49. NOTE: Even if your rifle measures a bit longer, we have found this bag is large enough to fit a Benchrest-style rifle with up to 28″ barrel. For shorter guns with big scopes, we recommend the 42″ AR15 case (item 360601). 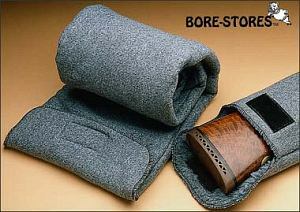 Bore-Stores are outstanding products, much better than the thin “gun socks” made by other companies. The fleece material is breathable, so it wicks away moisture from the firearm. By contrast, typical hard cases with “eggcrate” foam interiors attract and retain moisture — they can actually breed rust on your guns. Likewise, most zippered soft cases retain moisture. 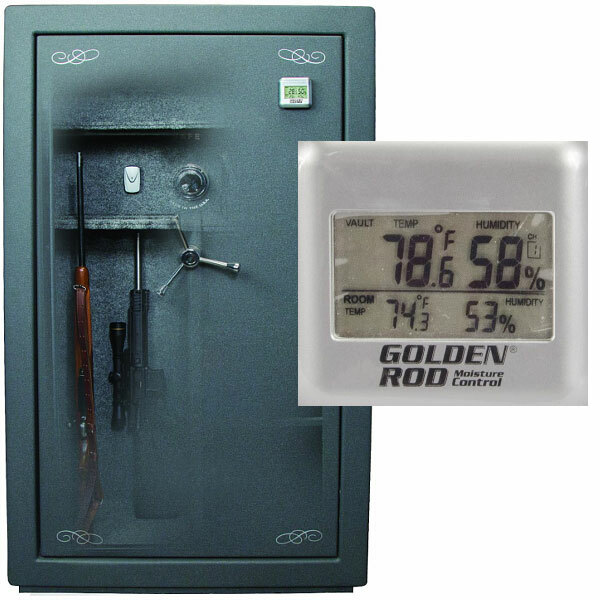 GoldenRods are electric heating elements that help prevent corrosion in your gunsafe by maintaining a constant temperature that is above the dewpoint. 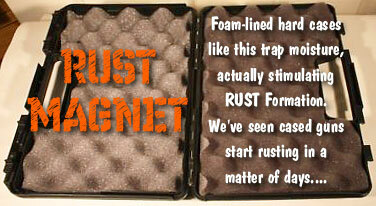 This prevents rust-breeding moisture from condensing on your guns. Both large and small GoldenRods are on sale this month at MidwayUSA, starting at $15.99 marked down from $19.99. The largest “gold” model (item 621013), which protects up to 300 cubic feet, is now $10.00 off, marked down to $29.99 from $39.99. Share the post "Bore-Stores and GoldenRods on Sale at MidwayUSA"
'Stainless' Steel — How Rust-Proof in Fact? Some folks feel that they don’t have to worry about rust and corrosion on stainless steel barrels, actions, and other components. That’s not really true. “Stainless” is a bit of a misnomer. First, there are different types of stainless steel alloys, with different degrees of rust resistance. 300 series stainless is more corrosion resistant than the 416 stainless commonly used in barrels. The composition (by percentage weight) of 416 stainless is 0.15% carbon, 12-14% chromium and the rest iron. 416 stainless steel lacks the roughly 10% nickel content that makes the 300 series more corrosion resistant in atmospheric conditions. CONCLUSION: Stainless steel barrels and components won’t rust nearly as fast as blued steel, but you still have to take precautions — particularly removing sweat and corrosive salts from the barrel. Also, don’t let moisture build up inside or outside of the barrel. We recommend wiping your barrels and actions with Eezox, or Corrosion-X after each use. These are both extremely effective rust-fighters that go on thin, without leaving a greasy residue. (Eezox leaves a clear finish, while Corrosion-X has a slightly waxy finish.) Also store your guns in Bore-Store synthetic bags when the guns go in the safe. Bore-Stores wick away moisture, and the synthetic fleece inner surface is treated with rust-fighting chemicals. Bore-Stores also protect your guns against dings and scratches. To discuss rust formation on stainless steel, visit this FORUM Thread. Share the post "'Stainless' Steel — How Rust-Proof in Fact?"